Pho Beef has a broth infused with the rich flavours of Basil and Soy. 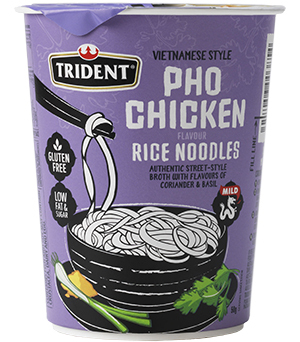 Trident Rice Cup Noodles are gluten free, low in fat and sugar making them a convenient meal option for busy, health conscious people. Pho Chicken has a light, fragrant broth with flavours of Coriander and Basil. 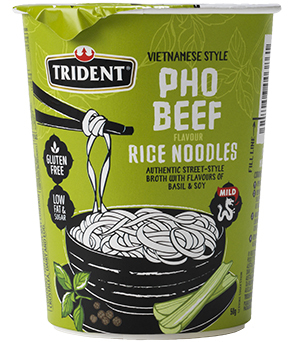 Trident Rice Cup Noodles are gluten free, low in fat and sugar making them a convenient meal option for busy, health conscious people. The quick and easy snack in a cup.The heat dial is turned up with Thai style creamy Tom Yum, which is an authentic spicy, tangy soup made with Chilli, Spring Onion & Kaffir Lime. 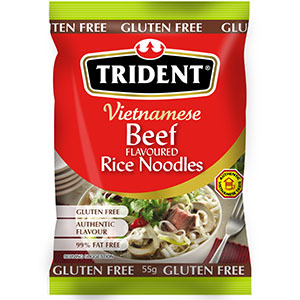 Trident Rice Cup Noodles are gluten free, low in fat and sugar making them a convenient meal option for busy, health conscious people. 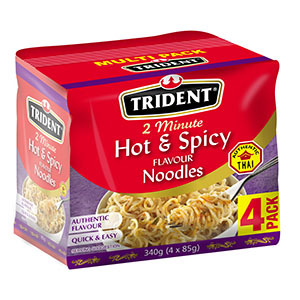 Short on time doesn't mean food has to be bland, made to a traditional Thai flavour, Trident Hot & Spicy Instant Noodles are the perfect snack when you're in a hurry. Short on time doesn't mean food has to be bland, Trident Tom Yum Instant Noodles are the perfect snack when you're in a hurry.